Published: March 1, 2013 at 07:24 p.m. 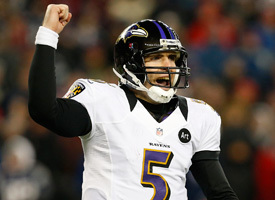 Updated: March 1, 2013 at 09:37 p.m.
Super Bowl MVP Joe Flacco's new contract agreement with the Baltimore Ravens is another reminder that general manager Ozzie Newsome is among the NFL's elite, carrying through with a long-term plan to transition the team's nucleus away from future Hall of Famers Ray Lewis and Ed Reed. Flacco's deal -- which he wasn't even aware of until news broke Friday evening -- is reminiscent of Ray Rice's five-year, $35 million deal to beat the clock just ahead of last July's deadline to sign franchise players. It's the same pattern the Ravens followed in extending standout defensive tackle Haloti Ngata ahead of the franchise-player deadline just a year prior. Newsome's negotiating arm, vice president of football administration Pat Moriarty, has worked quietly behind the scenes to ensure that Flacco, Rice and Ngata remain the franchise cornerstones while keeping the team in contention year-in and year-out. Now that Flacco is in the fold, Newsome and Moriarty will be tasked with decisions on the futures of linebacker Dannell Ellerbe, defensive end Paul Kruger and safety Ed Reed. Avoiding the exclusive franchise tag on Flacco leaves extra room against this year's cap, with Ellerbe as the most likely to land a lucrative long-term deal. Whether or not the Ravens re-sign that trio of free agents, Newsome's post-Super Bowl youth movement is off to a fine start with three franchise-caliber players locked up as the foundation for success.